There is perhaps no more insidious enemy to the skin and nails of our feet than fungus. Fungi may be small, but they are resilient, and they have an uncanny ability to invade our feet. Once fungus does so, it doesn’t stop there. It creates all kinds of uncomfortable, unattractive, and unhealthy problems if left untreated. And fungus isn’t content to stay put either, as it spreads quickly and easily from one person to another. While fungal infections can develop in other parts of the body, our feet are particularly vulnerable because of their frequent contact with environments that fungus love; moist surfaces like the surfaces in locker rooms and around swimming pools, and the darkness and warmth they find on our socks and shoes. Making matters worse, feet tend to have weaker blood flow than elsewhere in the body, making it harder for the immune system to fight back against infection there. Athlete’s foot may be the most widely known type of foot fungus because it is one of the most frequently contracted. This fungus got its name because it was (and remains) widespread among athletes who share locker rooms and showers. As noted, those wet environments, along with walking barefoot in them, make them fertile grounds for the fungus that causes Athlete’s foot to develop and spread. Athlete’s foot fungus belongs to a group of fungi called dermatophytes, which also cause jock itch and ringworm. These fungi love closed, warm, moist environments and feed on keratin, a protein found in hair, nails, and skin. 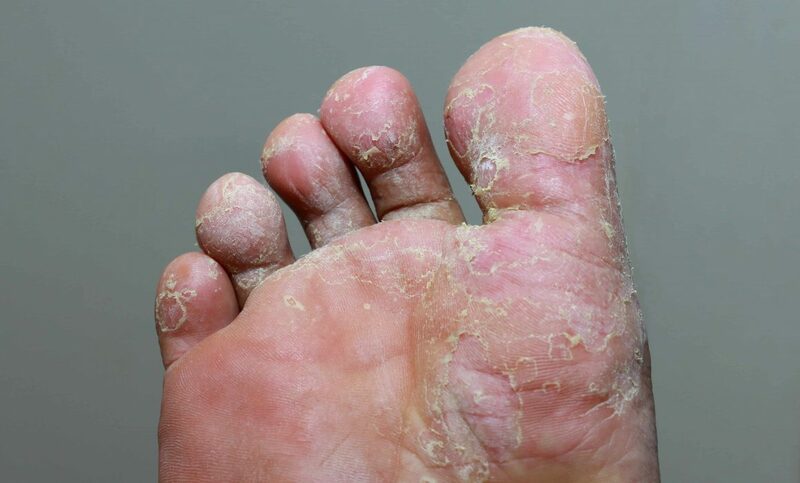 Skin inflammation and a white, scaly rash with a red base are common athlete’s foot symptoms, as are itching, burning, peeling, and a slight odor. Fungal infections of the toenails are highly contagious and easily spread. They are caused by dermatophyte fungus, yeasts or molds. These fungi enter the skin through tiny cuts or small separations between the nail and nail bed. As with Athlete’s Foot fungus, these toenail fungi live in moist environments and thrive within dark and warm conditions. Toenail fungus can cause your nails to become discolored, thick, brittle, and separated from the nail bed. If left untreated, it can lead to infections and other complications. Even when toenail fungus treatment appears to be successful and visible symptoms subside, repeat infections are a frequent occurrence. The experienced podiatrists at JAWS podiatry in Hollywood, Florida know how frustrating foot and toenail fungus can be. We welcome the opportunity to help you solve these common problems. For a personal evaluation and to learn more about our foot and toenail fungus treatment options, please contact us online or call us at (954) 922-7333.